This is a List of National Historic Landmarks in Texas and other landmarks of equivalent landmark status in the state. The United States' National Historic Landmark (NHL) program is operated under the auspices of the National Park Service, and recognizes structures, districts, objects, and similar resources according to a list of criteria of national significance. There are 47 current and one former NHLs in Texas. The landmarks in Texas are distributed across 29 of the 254 counties in the state. Nine of the sites are in Bexar County. 30°06′39″N 97°16′25″W﻿ / ﻿30.110833°N 97.273611°W﻿ / 30.110833; -97.273611﻿ (Bastrop State Park) Bastrop This park was designed in the 1930s as a showcase of Civilian Conservation Corps work. Its facilities were designed by CCC architect Herbert Maier. Cameron The Cabot was the last remaining of nine former Independence-class light aircraft carriers built in late 1943. War correspondent Ernie Pyle dubbed her the "Iron Maiden" as she served in nearly every major Pacific battle of WW II during her service without repair stops earning her nine battle stars and a Presidential Unit Citation. She would later be transferred to the Spanish Navy where she would serve from 1967-1989 as the SNS Dédalo. She was later purchased by preservation interests and returned to the U.S. first at New Orleans and then moored at Brownsville in 1997. As fund-raising efforts for her rehabilitation were ultimately unsuccessful, she was scrapped for salvage in "2000. 32°46′43″N 96°48′30″W﻿ / ﻿32.778611°N 96.808333°W﻿ / 32.778611; -96.808333﻿ (Dealey Plaza Historic District) Dallas Site of Kennedy assassination and surrounding buildings that are rumored to have held additional assassins. 29°18′16″N 94°46′58″W﻿ / ﻿29.304444°N 94.782778°W﻿ / 29.304444; -94.782778﻿ (East End Historic District) Galveston Galveston's East End was where the city elite built a number of elaborate mansions. 32°46′55″N 96°45′56″W﻿ / ﻿32.781944°N 96.765556°W﻿ / 32.781944; -96.765556﻿ (Fair Park Texas Centennial Buildings) Dallas Surviving Art Deco buildings from the 1936 Texas Centennial Exposition. 33°09′03″N 98°44′28″W﻿ / ﻿33.150775°N 98.741211°W﻿ / 33.150775; -98.741211﻿ (Fort Belknap) Young Key frontier post of the 1850s; now a museum. 30°35′45″N 103°55′33″W﻿ / ﻿30.595833°N 103.925833°W﻿ / 30.595833; -103.925833﻿ (Fort Davis) Jeff Davis From 1854 to 1891 Fort Davis protected migrants, mail coaches, and freight wagons, and controlled the southern stem of the Great Comanche War Trail and Mescalero Apache war trails. 33°12′29″N 98°09′53″W﻿ / ﻿33.208056°N 98.164722°W﻿ / 33.208056; -98.164722﻿ (Fort Richardson) Jack This Texas frontier fort was established in 1867 and abandoned in 1878. It was renovated and reopened as a state park in 1973. 29°28′35″N 98°25′51″W﻿ / ﻿29.476255°N 98.43083°W﻿ / 29.476255; -98.43083﻿ (Fort Sam Houston) Bexar Since the 1870s this facility has served as a major military base for the southern United States. It housed Geronimo following his capture, and has been used as the launching point for a variety of military operations. 29°20′32″N 98°26′37″W﻿ / ﻿29.342129°N 98.443645°W﻿ / 29.342129; -98.443645﻿ (Hangar 9, Brooks Air Force Base) Bexar Only surviving hangar of 16 built at Brooks Air Force Base (now Brooks City-Base) in 1918. Now a special events venue. Young A late prehistoric Plains Indian archeological site. 34°49′00″N 101°11′17″W﻿ / ﻿34.816667°N 101.188056°W﻿ / 34.816667; -101.188056﻿ (J A Ranch) Armstrong Founded by John George Adair and Charles Goodnight, this is still one of the largest ranches in the Texas Panhandle, and remains in the hands of Adair descendants. 30°14′27″N 98°37′27″W﻿ / ﻿30.240833°N 98.624167°W﻿ / 30.240833; -98.624167﻿ (Lyndon Baines Johnson Boyhood Home) Blanco Boyhood home of President Lyndon B. Johnson. Johnson lived here from the age of five until his high school graduation in 1924. 27°31′07″N 97°55′01″W﻿ / ﻿27.518611°N 97.916944°W﻿ / 27.518611; -97.916944﻿ (King Ranch) Kenedy, Kleberg, Nueces, and Willacy Founded in 1853, this is the largest ranch in the United States; it is larger than Rhode Island. Oldham This is a major Panhandle culture archeological site. 27°48′54″N 97°23′19″W﻿ / ﻿27.815°N 97.388611°W﻿ / 27.815; -97.388611﻿ (USS Lexington) Nueces This Essex-class aircraft carrier, known as "The Blue Ghost", was the fifth United States Naval ship named in honor of the Revolutionary War Battle of Lexington. After service in the Second World War and the Cold War, it is now a museum ship. 33°37′19″N 101°53′23″W﻿ / ﻿33.621944°N 101.889722°W﻿ / 33.621944; -101.889722﻿ (Lubbock Lake Site) Lubbock This major archeological site includes evidence from as far back as 10,000BC. The public can view ongoing archeological work at the site. 30°01′09″N 94°04′26″W﻿ / ﻿30.019167°N 94.073889°W﻿ / 30.019167; -94.073889﻿ (Lucas Gusher, Spindletop Oil Field) Jefferson The Spindletop Oil Field was in 1901 where the first major oil gusher of the Texas Oil Boom was discovered. 29°25′35″N 98°29′27″W﻿ / ﻿29.426460°N 98.490713°W﻿ / 29.426460; -98.490713﻿ (Majestic Theatre) Bexar This 1929 theater is the largest in Texas and the second largest in the United States. 29°23′27″N 98°29′34″W﻿ / ﻿29.390888°N 98.492760°W﻿ / 29.390888; -98.492760﻿ (Mission Concepcion) Bexar Part of San Antonio Missions National Historical Park, this 1731 Spanish mission was also the site of the 1831 Battle of Concepción, and early action in the Texas Revolution. 29°25′22″N 98°29′49″W﻿ / ﻿29.422778°N 98.496944°W﻿ / 29.422778; -98.496944﻿ (Jose Antonio Navarro House Complex) Bexar Home of Tejano rights advocate José Antonio Navarro, one of only two native-born Texans to sign the Texas Declaration of Independence. 25°56′48″N 97°17′07″W﻿ / ﻿25.946667°N 97.285278°W﻿ / 25.946667; -97.285278﻿ (Palmito Ranch Battlefield) Cameron Site of the 1865 Battle of Palmito Ranch, the last major engagement of the American Civil War. 26°01′17″N 97°28′50″W﻿ / ﻿26.021389°N 97.480556°W﻿ / 26.021389; -97.480556﻿ (Palo Alto Battlefield) Cameron Site of the 1846 Battle of Palo Alto, a precipitating event of the Mexican–American War. Hale A major archeological site known for Plainview point spear tips. 32°46′40″N 96°16′28″W﻿ / ﻿32.777778°N 96.274444°W﻿ / 32.777778; -96.274444﻿ (Walter C. Porter Farm) Kaufman Part of this farm was used as an experimental agricultural farm in the early 20th century. Successful experiments here led to the establishment of the United States Department of Agriculture's Agricultural Extension Service. 29°31′56″N 98°16′48″W﻿ / ﻿29.532222°N 98.28°W﻿ / 29.532222; -98.28﻿ (Randolph Field Historic District) Bexar The historic core of Randolph Air Force Base, this area was established in the 1920s as a training field for military aviators. 25°56′15″N 97°29′10″W﻿ / ﻿25.9375°N 97.486111°W﻿ / 25.9375; -97.486111﻿ (Resaca De La Palma Battlefield) Cameron Site of the 1846 Battle of Resaca de La Palma, fought early in the Mexican–American War. 26°24′22″N 99°01′05″W﻿ / ﻿26.406111°N 99.018056°W﻿ / 26.406111; -99.018056﻿ (Roma Historic District) Starr A well-preserved 19th century Rio Grande border town. 29°44′56″N 95°04′49″W﻿ / ﻿29.748889°N 95.080278°W﻿ / 29.748889; -95.080278﻿ (San Jacinto Battlefield) Harris Site of the decisive Battle of San Jacinto, securing the independence of Texas from Mexico. 29°33′32″N 95°05′17″W﻿ / ﻿29.559003°N 95.0881°W﻿ / 29.559003; -95.0881﻿ (Space Environment Simulation Laboratory, Chambers A and B) Harris This laboratory for testing equipment in space-like environments has been in use since 1965. 29°25′30″N 98°29′40″W﻿ / ﻿29.425082°N 98.494570°W﻿ / 29.425082; -98.494570﻿ (Spanish Governor's Palace) Bexar This early Spanish colonial house was home to aristocratic leaders of the Spanish Texas, and is now a city museum. 29°18′23″N 94°47′37″W﻿ / ﻿29.306389°N 94.793611°W﻿ / 29.306389; -94.793611﻿ (Strand Historic District) Galveston The Victorian downtown of Galveston. 29°45′15″N 95°05′22″W﻿ / ﻿29.754217°N 95.089499°W﻿ / 29.754217; -95.089499﻿ (USS TEXAS) Harris After seeing action in the First and Second World Wars, this ship was the first United States Navy battleship to become a museum, and the first to be named a National Historic Landmark. 30°16′22″N 97°44′28″W﻿ / ﻿30.272734°N 97.741078°W﻿ / 30.272734; -97.741078﻿ (Texas State Capitol) Travis The seat of Texas government, construction on this Italian Renaissance Revival building began in the 1870s. 27°02′42″N 99°26′36″W﻿ / ﻿27.045°N 99.443333°W﻿ / 27.045; -99.443333﻿ (Trevino-Uribe Rancho) Zapata Fortified house built c. 1830, shortly after San Ygnacio's founding. 30°42′53″N 95°33′10″W﻿ / ﻿30.714722°N 95.552778°W﻿ / 30.714722; -95.552778﻿ (Woodland) Walker This modest house was the home of Texas leader Sam Houston in the 1840s and 1850s. ^ Staff (April 15, 2015). "Learn about the National Historic Landmarks Program". National Park Service. Retrieved October 24, 2016. ^ Staff (June 2011). "National Historic Landmarks Survey: List of National Historic Landmarks by State (Texas)" (PDF). National Park Service. Retrieved October 24, 2016. .
^ Staff (September 5, 2014). "U.S.S. Cabot (CVL-28)". National Historic Landmarks Program, National Park Service. Retrieved October 22, 2016. 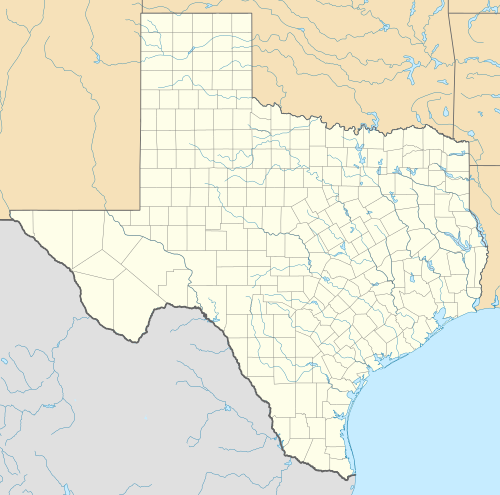 Wikimedia Commons has media related to National Historic Landmarks in Texas. "National Historic Landmarks Survey: List of National Historic Landmarks by State" (PDF). U.S. Department of the Interior. November 2007. Archived from the original (PDF) on 2007-06-09. Retrieved 2008-01-25. This page was last edited on 14 January 2019, at 12:59 (UTC).